Recipient : Dr. Kee Sun Ham, President & Founder of Hanseo University, South Korea. 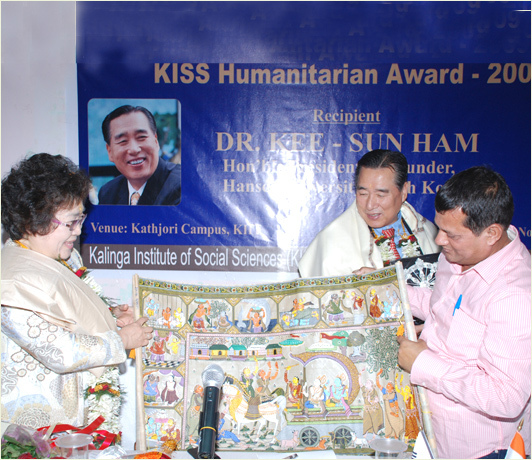 Dr. Ham Kee-Sun, President & Founder, Hanseo University, South Korea received the KISS Humanitarian Award 2009 from Dr. A. Samanta, Founder, KIIT & KISS. 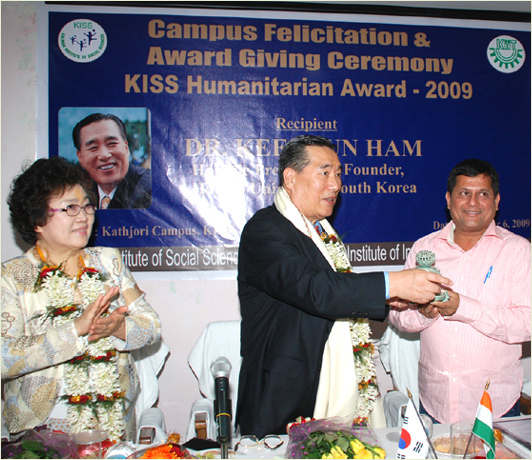 Dr. Ham Kee-Sun, President & Founder, Hanseo University, South Korea receiving the KISS Humanitarian Award 2009 from Dr. A. Samanta, Founder, KIIT & KISS. 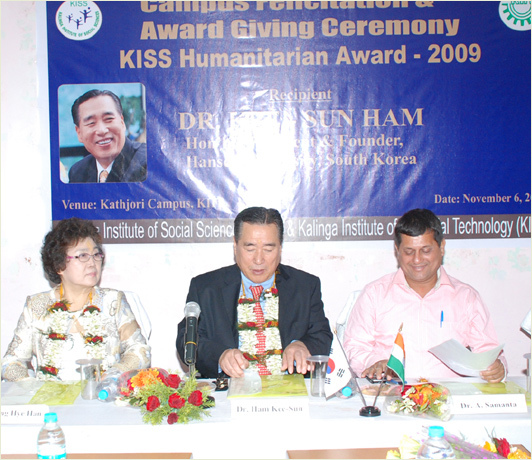 Dr. Kee Sun Ham, President & Founder of Hanseo University, South Korea flanked by Dr. Seung Hye Han, Hon’ble Director, Hanseo University, Oriental Medical Hospital & Dr. A. Samanta, Founder, KIIT & KISS at the Campus Felicitaion & Award giving ceremony held in KIIT campus on 6th November 2009. 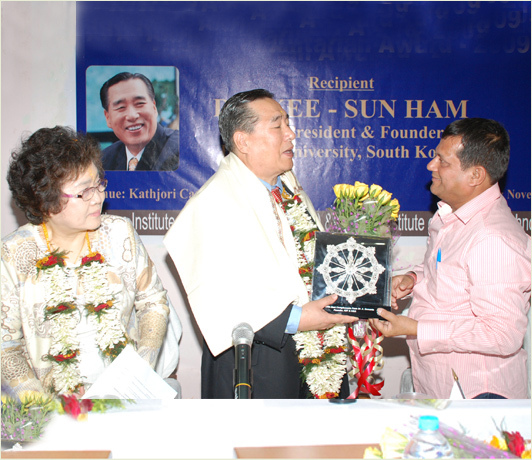 Dr. Kee Sun Ham, President & Founder of Hanseo University, South Korea being felicitated by Dr. A. Samanta, Founder, KIIT & KISS on the occasion. Dr. Seung Hye Han, Hon’ble Director, Hanseo University, Oriental Medical Hospital looks on. Dr. Seung Hye Han, Hon’ble Director, Hanseo University, Oriental Medical Hospital being felicitated by Dr. A. Samanta, Founder, KIIT & KISS on the occasion. Dr. Kee Sun Ham, President & Founder of Hanseo University, South Korea looks on. 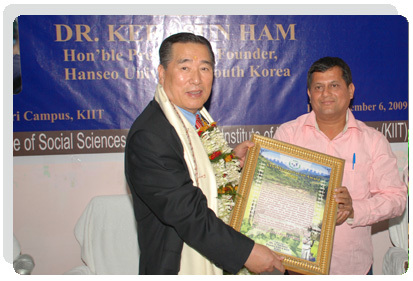 Dr. A. Samanta, Founder, KIIT & KISS receiving a memento from Dr. Kee Sun Ham, President & Founder of Hanseo University, South Korea. Dr. Seung Hye Han, Hon’ble Director, Hanseo University, Oriental Medical Hospital looks on.